Tags: charitable wedding favours, elephants. 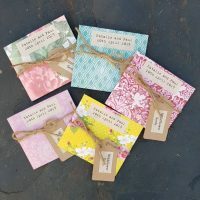 These seed packets are charity wedding favours in aid of Elephant Family. Elephant family is a dynamic NGO on a mission to save a forgotten species from extinction – the Asian elephant. Every day in India alone an elephant kills a human and a human kills and elephant in a battle for space and food. Elephant Family exists out of urgent necessity due to a serious lack of investment and attention going into this conservation and humanitarian issue and funds projects across Asia to stop this conflict from happening. 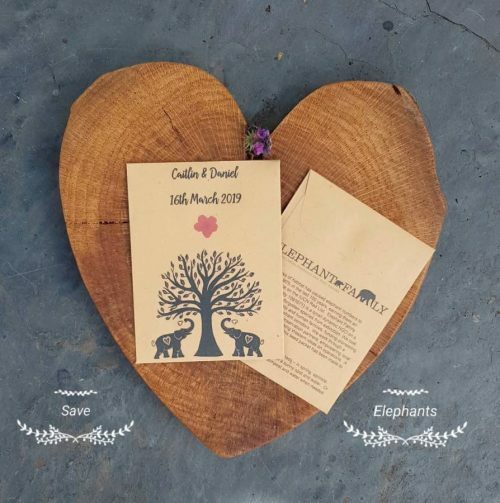 Here at Wildflower Favours we are passionate about the plight of these endangered species and have joined forces with Elephant Family to help raise funds to create safe homes for both elephants and people. 20p from every packet sold will go towards this magnificent cause. Please help support Elephant Family by giving your guests these seed packets as wedding favours. The wildflower seeds inside (about a gram in weight) are also perfect for butterflies and bees. This seed packet is recycled and the seeds are British species grown in the UK. 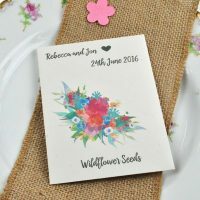 They are also personalised with your wedding details – please advise these in the box above. 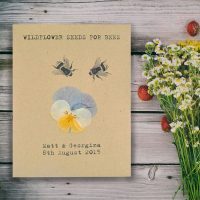 Seeds in this seed packet include Cornflower, Corn Chamomile, Poppy and Corn Chamomile.